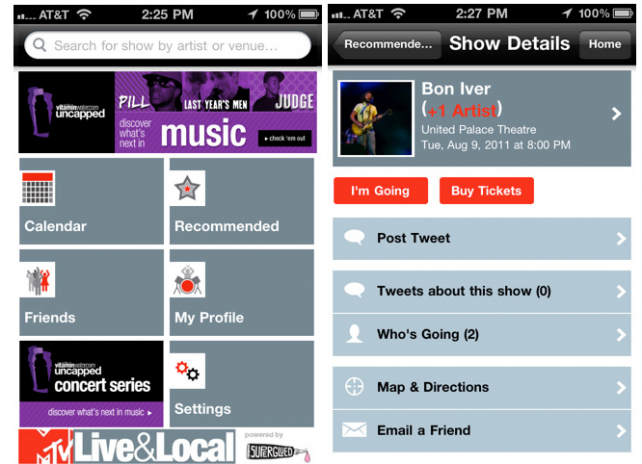 MTV Networks has released MTV Live & Local, an iPhone app built to find concerts near you. The application was created through cooperation with SuperGlued, a social networking site geared towards musicians and concert attendees. Live & Local is designed to make finding local music and organizing your concert schedule a bit easier. The application’s search bar allows users to search for local shows, specific tour dates, and even artist bios. Users can view local shows on a daily calendar or compile a unique schedule built around events you plan to attend. The app is heavily integrated with Facebook, Twitter, Foursquare and SuperGlued. Live & Local even lets users ‘recommend’ shows to Facebook friends and Twitter followers. Live & Local features access to maps and directions, along with the ability to purchase tickets through several different ticket agencies. While there is no way to sync your in-app schedule with your device’s native calendar or other calendar services, Live & Local will guarantee you a vast database of concert schedules and more. 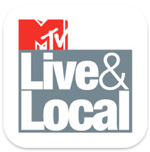 MTV Live & Local is available from the iOS App Store free of charge.